Dressed in a yellow gown and rainbow cape, drag queen, Topsie Redfern, reads a story to a group of young British children about a little girl who likes herself – even when she develops “stinky toes” and “purple polka-dotted lips”. “It is really important to remember we are all different and it is good to like ourselves for what makes us different from each other,” Redfern told about 20 children aged one to five at a central London pre-school. Redfern is one 30 cross-dressing male performers touring British schools as part of Drag Queen Story Time, telling stories that spread a message of self-acceptance to promote diversity in early education. The idea originated in the United States in 2015 when writer and LGBT+ parent, Michelle Tea, was looking for ways to introduce her young son to ‘queer culture’. “Drag queens are a no-brainer for kids’ events,” Tea told the Thomson Reuters Foundation by phone from Los Angeles. Used to the limelight of nightclubs and bars, they also know how to handle a raucous crowd, she added. In a few years the format has spread all over the world. 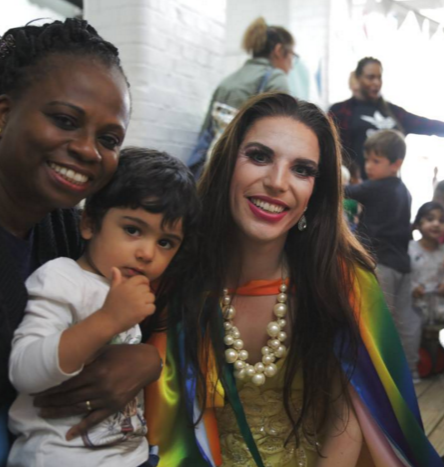 Also known as Drag Queen Story Hour, the group has opened more than 25 chapters worldwide, holding readings at hundreds of nurseries, schools, libraries and other venues across the Americas, Asia andEurope, Tea said. Tea said the reception had been overwhelmingly positive, particularly in big cities. But story hours have also drawn controversy in some corners of America, where conservative groups have criticised the initiative as amoral and inappropriate for children. A US group named Common Sense Campaign Tea Party organised a small protest outside a library in Mobile, Alabama, where a story time was held earlier in September – but it was outnumbered by a counter-demonstration, local media reported. In Lafayette, Louisiana, plans to hold a reading at a public library have sparked controversy. The city’s Republican mayor has said he would look to cancel or move the October event. Tea said drag queens, like any artists, were capable of adapting their act and making it appropriate for young audiences. “Drag isn’t by definition adult entertainment,” she said. Teaching children about diversity made them better citizens, she added – a view echoed by LGBT+ activists in Britain. Young LGBT+ people are less likely to experience bullying in schools that create inclusive environments and celebrate difference, said Sidonie Bertrand-Shelton, head of education at British rights group Stonewall. “Bringing in LGBT role models like drag queens and teaching about diversity means children from all families feel welcome and helps every young person understand that LGBT people are part of everyday life,” she said. Almost half all British teenagers who are LGBT+ or questioning their sexuality have self-harmed, according to a study released in August that found homophobic bullying and “highly gendered” environments were partially to blame. At the London nursery, Redfern’s gender appeared of little concern to the children, who were much more interested in the flashy jewellery worn by the performer. At one point, a heavily made-up Redfern acted out an adapted version of the The Three Little Pigs – replacing the pigs of the fairytale with “little misses”, who outsmart the wolf. “Generally in fiction and children’s fiction, the boy is the hero. The boy saves the girl, (while) the girls are submissive characters, whereas that story is empowering,” said the cabaret artist and actor trained in musical theatre. Nursery manager, Gregory Lane, said there were educational benefits to Drag Queen Story Time. “Drag queens happen to be very good at telling a story and making that story come alive for young children so that it’s not just words on the page and it’s a story that they can stretch their imagination,” he said. For Redfern, who spoke of the difficulty of not being allowed to wear girls’ clothes outside home when growing up, the focus was on showing children it is ok to be different. Almost a third of those aged between 18 and 21 in the United States, and 17 percent of 16- to 18-year-olds in Britain identify as LGBT, according to separate surveys. “In every class there’s going to be a girl who’s a tomboy (or) a boy who likes running about in a Princess Elsa dress,” Redfern said, referring to the Disney movie, Frozen.